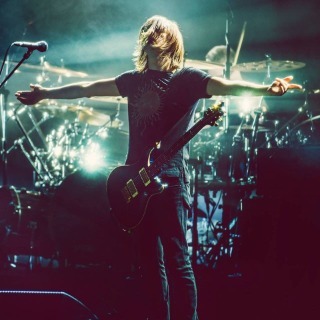 One of the most eclectic and prolific artists in #rock #music, Steven Wilson has been writing, recording, and producing music continuously since the age of 10. A native of Hemel Hempstead in England, Steven was first exposed to music at the age of eight, when he started hearing his father listening to Pink Floyd’s “Dark Side of the Moon,” and his mother to Donna Summer’s “Love to Love You Baby,” two albums that were pivotal in the development of his musical direction. His father, an electrical engineer, built him a multi-track tape machine, and he began to #experiment with overdubbing and developing a repertoire of #production techniques. Early demo #tapes started to emerge in the mid 80’s while Steven was still at school, and at the end of the decade he created the two projects which gained him entry to the #professional music world: Porcupine Tree and No Man. Porcupine Tree, which explored psychedelia, #progressive music, and his love of ambitious seventies music, was initially an imaginary “band” which, in reality, Steven overdubbed all the #instruments himself. This even extended to early demo tapes coming with a fictional written history of the band, and biographical info about the fictitious performers. Around the same time, Steven formed No-Man, his long-term collaboration with singer Tim Bowness. Influenced by everything from ambient music to hip-hop, their early #singles and #albums were a mixture of dance beats and lush orchestrations. Signing to One Little Indian in the UK, and Epic in the US in 1990, they received tremendous accolades from the music press, with Singles Of The Week in Melody Maker, Sounds and Hot Press. Meanwhile, things progressed with Porcupine Tree, whose increasing popularity was fast outpacing the imaginary pretext of an actual group. The second full-length album, Up the Downstair was released in 1993 and was praised by Melody Maker as “a psychedelic masterpiece… one of the albums of the year.” This was the first album to include keyboardist Richard Barbieri and bassist Colin Edwin, albeit only as guests at this point, the album was still effectively a solo project. The next album The Sky Moves Sideways was a transitional album featuring both solo SW and band pieces, but from then on it became a full #band with the addition of Chris Maitland on drums. Further albums throughout the late nineties, and extensive touring resulted in a string of indie chart placings and critical acclaim, many fans hailing them as the Pink Floyd of the nineties. In 2001, Porcupine Tree was signed to US label Lava Records, under the auspices of Atlantic Records. Now with the support of a major label, and featuring new drummer Gavin Harrison, In Absentia saw the light of day in 2002, featuring a heavier sound than all the group’s previous works. It charted in many European countries and remains one of the top-selling Porcupine Tree albums. It was also their first album to be released in 5.1 Surround Sound,, and won the “Best Made-For-Surround Title” award for the Surround Music Awards 2004. Its 2005 follow-up, Deadwing was inspired by a film script written by Steven and film-maker Mike Bennion, and became the first Porcupine Tree album to chart around the world. The album won “Album of the Year” at the Classic Rock magazine awards, and its surround version received the “Best Made-For-Surround Title” once again. The following year the band released Fear of a Blank Planet, which was nominated for a US Grammy, and won several polls as the best album of the year. Their tenth studio album The Incident was #released in late 2009, and became their highest charting album to date, again received a Grammy nomination, and was followed by another extensive tour that included arena shows and concluded with sold out shows at Radio City Music Hall in New York, and the Royal Albert Hall in London. 2010 ended with their status as arguably the biggest “underground” band in the world cemented. Starting in 2003 Steven quietly started to release music under his own name, in the form of a series of two track CD singles on his own label Headphone Dust, each one featuring a cover version and an original SW song. The choice and treatment of the cover versions was unpredictable, as it featured songs by Alanis Morissette, Abba, The Cure, Momus, Prince, and Donovan. Stylistically these cover versions allowed Steven to expand his musical palette into everything from #electronica, noise music, and stripped down #acoustic balladry. This led to his decision to record his first #solo album of #original music. Between January and August of 2008, Steven began recording material that would comprise Insurgentes. Comprising 10 new tracks that range from ballads and anthems to all-out industrial noise assaults, the dark, #cinematic, and richly textured disc represents two years’ worth of creative output and numerous recording sessions worldwide in studios from Mexico City to Japan to Israel. The whole process was #visually documented by film-maker Lasse Hoile, and the work in progress Insurgentes film features footage of the recording sessions, surreal sequences, and interviews with Steven and many other musicians about what it means to be a musician in the age of iPods and download #culture. A second solo album Grace For Drowning was recorded in 2010-11 and released in September 2011 on CD, vinyl and Blu-ray formats as a double disc designed to be listened to as two single albums, with the individual parts named Deform to Form a Star and Like Dust I Have Cleared From My Eye. The album received massive critical acclaim, and charted all over the world, notably charting in the top 40 in UK, Holland, Germany, and reaching the Polish top 10. It was nominated at the 54th Grammy Awards for Best Surround Sound Album. Shortly before the release of the album SW also announced his first solo tour, in Europe and North America. The first leg of the tour took place in October and November 2011 and contained songs from both Insurgentes and Grace for Drowning. The #tour featured quadrophonic sound and many new visual elements. A second leg of tour took place in April-May 2012, this time also taking in South America, and including a brand new 12 minute piece Luminol, which had been written specifically for the new band line up to play. A live DVD/Blu-Ray recorded in Mexico titled Get All You Deserve was released on 25 September 2012, again charting all over Europe (number 2 in Germany, number 5 in UK). At the same time that Steven was working on Grace For Drowning, he was also working on a #collaboration album with his long term friend, the leader of Swedish band Opeth Mikael Akerfeldt. Their collaboration was eventually released in May 2012 under the name of Storm Corrosion, and going against all expectation was an extremely atmospheric and darkly orchestrated album, very influenced by both musician’s love of artists such as Scott Walker and Talk Talk. Steven has become known for the high standard of his production and is a sought-after #mixer and #producer. Artists he has worked with in this capacity include the Norwegian artist Anja Garbarek, Anathema, and Swedish progressive-metal band Opeth for whom he produced and/or mixed four albums. Other projects include Blackfield, a collaboration with Israeli megastar Aviv Geffen which has now produced two acclaimed albums, and Steven’s drone / ambient / #experimental outlet Bass Communion. In September 2012, Steven won “Guiding Light” at the “Progressive Music Awards” 2012. Since the start of 2012 Steven has been writing and recording a third solo studio album, with the members of his touring band. Principal sessions for the album took place in Los Angeles during September 2012, with legendary producer Alan Parsons engineering. The album was released in February 2013, followed by an extensive tour. The line up of the band was SW, Guthrie Govan (guitar), Adam Holzman (keyboards), Theo Travis (flute / sax), Nick Beggs (bass / stick), and Marco Minnemann (drums). Wilson's fourth solo album "Hand Cannot Erase" was released on 27 February 2015. The supporting tour spanned from March to June 2015 and consisted of 31 shows in Europe and a total of 34 shows in North and South America. The Guardian rated the album five stars and called it "a smart, soulful and immersive work of art". On 12 December 2016, Wilson began recording his fifth solo studio album with engineer Paul Stacey in London. With the departure of most of the members of his solo band from prior album, Wilson will handle most of the guitar on the album, with Craig Blundell and Jeremy Stacey both contributing drums. Ninet Tayeb was featured on additional vocals. In April 2017, Wilson announced that he had switched #record #labels for the release, with the album to be released on Caroline International. On 9 May 2017, the album was officially unveiled as "To The Bone" and released on 18 August 2017. Wilson has embarked on major tours in 2018 to promote "To The Bone" in the UK, Europe and North America and the tour extends into 2019 with more Europe dates.